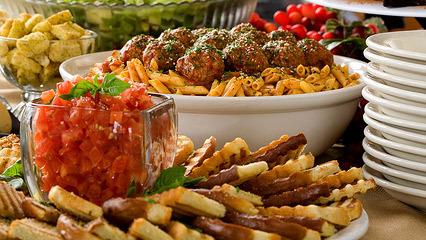 Ariana's Catering offers the best authentic continental cuisine. Ariana's has established a great reputation in providing the finest service in the banquet and catering field. Whether you need food for 20 people or 1000, Ariana's Catering will provide amazing food to any location in the Tri-State Area. Ariana's commitment and passion for amazing food, flawless service and creative presentations has earned us a remarkable reputation within our community. Our chef, who produces unforgettable cuisine, only works with high quality, fresh ingredients and whatever the occasion, you can trust your event will be handled by professionals who are dedicated to meeting your needs. Our professional staff of experienced servers, under the expert watch of our banquet managers, will make your every dream a reality. Ariana's world class chefs are among the finest in the field. We incorporate a menu that is second to none. From carving stations, to full sit down dinners, our splendid ball rooms will provide the perfect setting to celebrate life's special moments. From wedding to sweet sixteen's and ever special event in between, we create the perfect setting for enchanting celebrations, the memories of which will last a lifetime! Looking for a unique new space to host your next party come and see what all the buzz is about! Meet with Ariana's top vendors and book your next event. Bring a friend..